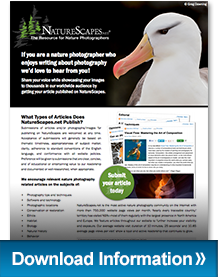 Share your voice while showcasing your images to thousands in our worldwide audience by getting your article published on NatureScapes. Read more below or download our guidelines PDF for information. You can also spread the word by printing the PDF and posting at your local camera club or educational institution for photography. NatureScapes.net (the "Website") is an online resource designed and created for people who share a common interest in and desire to exchange information about nature photography. Our readers encompass a variety of stages of development in their craft but are typically quite knowledgeable and dedicated to the pursuit of nature photography. What types of articles does NatureScapes publish? Submissions of articles and/or photographs/images for posting on the Website ("submissions") are welcomed at any time and must be submitted in electronic format via email to the editors. In your email, please inform us if any part of your submission has been previously published, and if so, where and when it has appeared. Acceptance of submissions, whether articles or photographs, will generally be based on thematic timeliness, appropriateness of subject matter, clarity, adherence to standard conventions of the English language, and conformance with all Website policies. Photos submitted must be your original copyrighted works or photos that you have specific permission from the author to use for your submission. Preference will be given to submissions that include your original works, are clear, concise, and of educational or entertaining value to the readership of the Website and documented or well-researched, when appropriate. We reserve the right to edit content. The right to refuse to post or to accept for publication any submission on the Website is our sole discretion. Preference will be given to submissions that are clear, concise, and of educational or entertaining value to the readership of the Website and documented or well-researched, when appropriate. We reserve the right to edit content. The right to refuse to post or to accept for publication any submission on the Website is our sole discretion. NatureScapes does not publish articles with royalty-free photographs that we cannot 100% verify the origin. As a website focusing directly on photography we prefer images that are original and, ideally, belonging to the author. Target a large audience: NSN is the most active nature photography community on the internet. We are visited hundreds of thousands of times each month1. Show your talents: The better the content, the more it will be seen. Articles are featured throughout the website to further increase your visibility and exposure. Get more face time: The average time on the website by visitors (10 minutes, 25 seconds) and average page views per session (10.85) show a loyal and active readership that continues to grow2. Worldwide audience: Nearly every traceable country/territory has visited NSN—most of them regularly with the largest presence in North America and Europe. Established credentials: 9 years of established presence as an active online community show NatureScapes has a proven track record with growth each year. Article content in a Microsoft Word (.doc) or plain text (.txt) document. Please include the article title and your name at the top. Images in a JPEG (.jpg) format. Images should not exceed 750kb in size, nor should their longest side exceed 1024 pixels wide or 800 pixels tall. Do not include a watermark on your photographs. As photographers ourselves, we respect your images—we will add “© Your Name” to your images in our universal website style font for consistency. If applicable, specify the placement of your images within the article (by file name) and any captions. Save the files of your photos (and refer to them) using distinct names (ex. firstname-lastname-hummingbird.jpg). A short biography of 150 words or less (in a .doc or .txt file). You may include links to your website, blog, and social networks. Biography information appears at the bottom of articles. A photo of yourself sized to 120x120px at 72dpi for placement beside your bio. Inform us if any part of your submission has been previously published, and if so, where and when it appeared. Your NSN forum username (if you have one). The image sized to 1024 pixels wide without a watermark. If selected, we will add “© Your Name” to the image along with its title and the NatureScapes.net logo type. A short image caption, about one or two paragraphs in length. In your caption mention where the photograph was taken. The entire package may be compressed into a ZIP (.zip) file for ease of sending. Failure to follow these guidelines may result in rejection of your submission and you will be asked to resubmit your materials. Send your submission to editors@naturescapes.net. We will reply as soon as possible, generally within 3-5 business days. ii. the submission is a work original to the author (unless identified by you as containing original works of third parties) and that such submission, including all third party works of authorship, does not infringe any copyright, trademark, trade name (or knowingly infringe any patent or any other proprietary right) of any third party. Please do not submit photos that are public domain or, if you are not the photographer, please do not submit photos you do not have specific permission to use by the photographer. Any article, text, photograph, image or other published submission will remain in the archives on the Website in perpetuity or until such time as the Website removes the material. We may transfer this license and its obligations hereunder at any time and without prior consent to any corporate successor in interest, acquirer or other entity that purchases or otherwise obtains substantially all of our business assets or stock, or to any parent corporation or entity, any subsidiary corporation or entity, or any of our divisions that are operated as a separate business. Please direct further inquiries to the editors by email at editors@naturescapes.net. 1. Approximate average page views per month for the first quarter of 2013 was 767,142. 2. Views/visit and average visit time are as of March 2013 from SimilarWeb public information. All other reported statistics are from Google Analytics.